Could the President-elect's support of school choice trickle down to Spokane? Lily Eskelsen Garcia (center), president of the nation's largest teachers union, on a visit to Roger High School last week. For Lily Eskelsen García, the president of the nation's largest teachers union, schools like Rogers High School can teach the country a lesson. 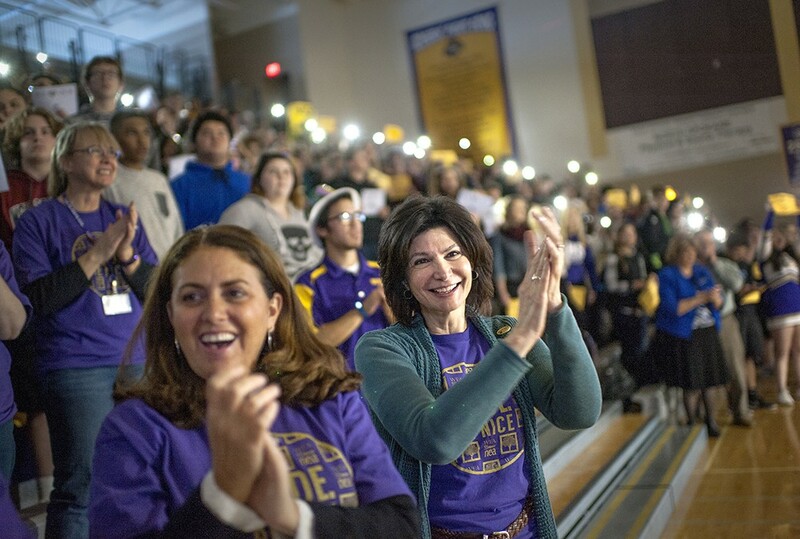 "We're always looking for a story about a school that's doing something creative, that's doing something real," says García, president of the National Education Association. Rogers is one of those stories, says García. She says it's an example of how education can be reformed without opening a new charter school, and without the government either dangling some reward for high performance or threatening punishment. Instead, she says, Rogers has "humanized" education by building relationships with students and creating an environment where they want to succeed. On a chilly November day a couple of weeks ago, García visited Spokane for the first time. She had heard about the rapid improvement in Rogers' graduation rate from Debby Chandler, president of the National Council for Education Support Professionals. Rogers, where Chandler oversees student attendance, saw its graduation rate jump 30 percent from 2009 to 2014. Schools like this, García says, should be where public dollars for education are invested. But she fears that won't be the case under President-elect Donald Trump, who on the campaign trail proposed a $20 billion national school voucher program, which would pay students to attend a private school instead of a public school. And a week after García visited Spokane, Betsy DeVos, a supporter of vouchers and of charter schools, became Trump's pick for education secretary. DeVos' nomination has magnified the national debate over school choice. And with Washington in the midst of a judicial battle over the existence of charter schools, García, along with local education leaders, is wondering how possible changes aimed at privatizing education would translate to public education both nationally and locally. Vouchers are only legal in 13 states. But Jenny Rose, Spokane Education Association president, says she would be worried if the federal government somehow navigated around Washington state law to mandate that the state distribute vouchers. "That's our taxpayer dollars going to private schools, where there's no regulation," Rose says. García says the issue with vouchers is that they could take away money from other vital educational programs, including funding for poorer schools, English language learners or special education. "We are worried to death that [the Trump administration] is about to dismantle special education," García says. DeVos, a pro-charter-school advocate in Michigan, helped craft the state's charter-school policy. The results there have been mixed. Detroit has the second largest share of students attending charter schools in the country, and critics say Detroit's high number of for-profit charter schools, coupled with a diminishing number of students overall, has created a chaotic environment for families competing to get children into top schools, while other schools have been forced to shut down. Reading and math test scores in Detroit have been among the worst for any big city in the nation. Charter advocates, however, point out that students in Michigan charter schools have made larger learning gains in reading and math than students in Michigan public schools, according to a 2013 study by the Center for Research on Education Outcomes. García has criticized for-profit charters. She says the NEA is studying the impact of charter schools and whether there are any that improve the system. "You could open up a charter school across the street," García says. "But at what expense to Rogers High School?" However, the charter-school discussion in Washington, and especially in Spokane, is much different. A limited number of charter schools are legal in Washington, although unions are currently challenging that legality in court. Washington's charter-school law only allows a limited number in the state, and the law does not allow for-profit charters. Washington State Charter Schools Association CEO Tom Franta says that García has "perpetuated a number of myths that don't exist in Washington." He says that Spokane Public Schools, the only district in Washington to authorize its two charter schools, can be a model for the country. "All [Washington charter] schools are run by nonprofit entities," Franta says. "These are absolutely public schools, and absolutely serving public school students." Travis Franklin, who started Spokane International Academy, one of the city's two charter schools, says that money for charter schools follows students, rather than taking away from public schools. Spokane International Academy, about 10 blocks from Rogers, offers an approach to education that he says can't be found anywhere else in the area. Franklin says that he wouldn't be in favor of an "outright expansion" of charter schools, claiming he would rather see an approach that ensures there are quality schools for students in Spokane and across the nation. But he's still trying to determine how Trump's presidency may change education policy.